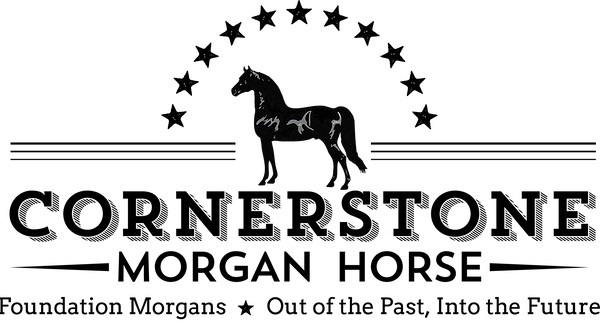 In May of 2001 my husband and I trailered our 2 Morgan horses from Wisconsin to Wyoming to ride in the Big Horn Mountains . As part of this trip we stopped by Bar None Morgans in Thermopolis, Wyoming to see their Western Working stallion S Bar B Pierre Noire. Harvey Seidel led us out to the breeding paddock where he kept Pierre, surrounded by mares. Although it was obviously breeding season for Pierre, Harvey walked right into his pen and invited us inside. Pierre was every inch the gentleman, as he allowed us to pet him all over, and even lead him out of his pen and away from his mares. This was one gorgeous horse: big, solid bone, jet black, gentle, and every inch a Morgan. I was sold on this stallion even before Harvey invited me to saddle Pierre and ride out into the fields. Although we had not planned on breeding any mares that year, it just so happened that my mare Caroline came into season right that week. We left her there to breed to Pierre. The plan was to leave her at Harvey’s over the winter, and then come back the next spring after she foaled. Of course, that meant there was an empty spot in our trailer. Harvey had a herd of yearlings by Pierre out in a field, and the buckskin filly Bar None Spring Brooke just followed me home!! That started a wonderful relationship with Harvey and his beautiful black stallion. We now have 3 of Pierre’s daughters, all out of different mares, and all different colors. My ½ Lippitt mare Caroline foaled a lovely bay filly that we named Crosscut Lady Jane. The following year we bred our Government mare Glory to Pierre , and this spring we got another filly we named Crosscut Kachina Doll. Doll is black all over, except for some mealy brown around her eyes and muzzle. I believe the AMHA calls that color ”brown”. 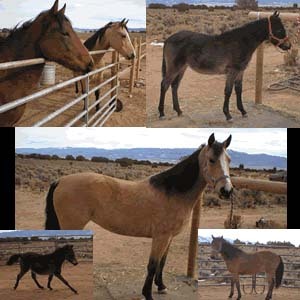 So now we have a buckskin, a bay, and a brown filly, all out of Pierre . Although the colors are different, all 3 girls have the same excellent confirmation, solid bone, and size. But what we found really impressive is that Pierre’s foals all have his wonderfully laid back personality. They are easy to train— a trait that is very important for us amateurs— and eager to please. The buckskin filly Brooke was trained to drive as a 2 year old, and this past summer I just saddled her up and took her out onto the trails. Even though she is really only a green broke saddle horse, she behaves so well that all my Quarter Horse friends are envious! I look forward to training my yearling and weanling fillies, as I know they will be just as easy to work with. Harvey and Lois Seidel are wonderful folks, who have a genuine (black) goldmine in their Morgan stallion Pierre.